A cultivar of Camellia japonica L. ‘Paeony form with 14-18 petals in 2 rows, inner petals small, twisted and confused. White with an occasional pink stripe.’ [Berlèse, 1840, Monographie ed 2 p.80, 225, quoted in the ICR]. William Herbert does not mention the pink stripes but they are evident in the illustration. [Berlèse Iconographie vol.II pl.177/1843]. Bred by William Herbert before 1837 and first described in the supplement to his Amaryllidaceae. 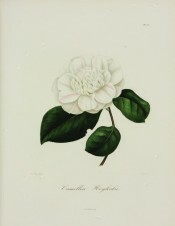 ‘The finest double varieties of Camellia Japonica which I have raised are as follows: From the single white by the pollen of Pompone, 1. var. Spofforthiae, or Spofforth striped, very large and very double white, with a few pink stripes, and occasionally one or two anthers. 2. v. Maculosa, or Calypso, do. 3. v. Haylocki, or Haylock’s white; pure white, rarely a few anthers. 4. v. Eburnea, or Ebur; very vigorous, pure white; somewhat waratah shaped. 5. v. Nivosa, or Nitor; double white, variable in form. 6. v. Fortuita, or Fortuna; very like var. 1. 7. v. lactescens, or Luna; double white.’ [Herbert p.367]. Desideratum to Loddiges’ nursery on the 6th January 1845. Not recorded as received and there are no further records. [MP A2933-2, p.28]. ‘Haylockii’ is listed in the 1836 edition of Loddiges’ Nursery catalogue, a copy of which is held at Camden Park [CPA]. It is marked with an ‘x’ usually denoting common before or long introduced but its meaning here is unclear.